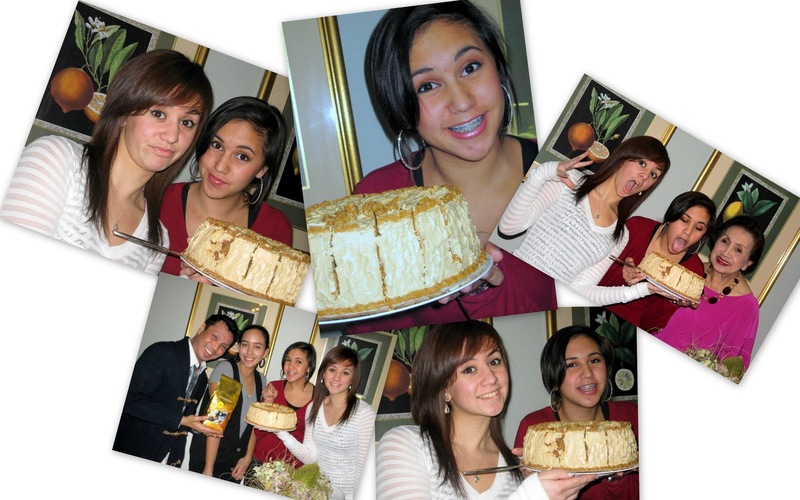 We're a little photo crazy on my side of the family, particularly when we're all together. We don't get to see each other that often, so Thanksgiving is a photo clickfest. My sister runs around with her camera like a paparazza. Here she is taking a picture of my dad carving the turkey. My sister kept saying, "You'll be glad later that I took so many pictures!" My Uncle P. kept joking, "Oh, we'll see these pictures on the Facebook." My sister posts tons of pictures on Facebook. My mom says, "What's the Facebook?" Even though my mom doesn't know exactly what Facebook is, that didn't stop her from using her camera/video camera that she just bought on the Home Shopping Network. She says it's high quality. Do you think she means number of pixels or zoom strength? No way. My fashionista mother means that when it's closed it looks like a quilted purse, and when she's at the Filipino parties she constantly attends, no one will know it's an electronic device. We took a gazillion pictures of the flower arrangements my sister and brother made from odds and ends they found in the yard. It's slim pickings when it comes to decorations in my house. Decorations are not my thing. But when you have talented siblings who can make something out of nothing, who needs stuff from the craft store? And of course, photos of the turkeys. Anthropologists might look at this picture 100 years from now and assume the woman decked out in the silk dress and big jewelry brined those bad boys, threw them into hot oil and fried them until they were crisp and juicy. But they would be wrong. For the record, I did the brining and my husband, with the help of my brother-in-law, got the fry job done. That's me at the stove trying to save the leek and sour cream mashed potatoes which were as lumpy as a gravel road. That's what you get when you have an Asian girl make the mashed potatoes. I tried to cook the halved potatoes first in the slow cooker for four hours. They were still hard, so then I boiled them in water for another 20 minutes and then tried to mash them. Too hard. I tried ricing them, but it didn't work. Too hard. How potatoes could be hard after cooking for hours is beyond me. Note to self: cut the potatoes in smaller pieces and forget the slow cooker. Here's my Irish-American husband trying to fix the potatoes. His genes didn't give him a pass either. They were still lumpy. But you know what? No one said a word. God forbid if I had made soggy rice, but the potatoes? Whatever. Here's my dad slicing the turkey. He's a surgeon, so you can imagine why we all defer this job to him. and my brother's cornbread, sausage, and cranberry stuffing (here's a link to my recipe which doesn't have cranberries but easily could). Rounding out the menu were shredded brussel sprouts with candied walnuts, gravy, my sister's cranberry relish, and of course, (non-soggy) white rice. ... the Filipino mocha cake. Forget turkey, stuffing, mashed potatoes, veggies, or the apple, pumple (pumpkin-apple), and pecan pies. If we had the mocha cake, we'd be all set. Mocha cake is awesome. A chiffon cake infused with coffee flavor, it's light and springy. Like other Asian cakes, it's not too sweet. And the buttercream frosting is the perfect finish. My mom brings two cakes with her across multiple state lines, so Thanksgiving will be true Thanksgiving. The cake is made by Tita Marge -- she's not my aunt, but Filipino kids call everyone "Aunt" or "Uncle." Tita Marge makes Filipino food to order, which is right up my mom's alley since she doesn't cook. I begged and pleaded Tita Marge to give me the recipe at my parents' 50th anniversary party. You would have thought I was asking for her ATM pin number. One day, I'll have to figure out how to make this cake, but maybe not. Waiting to eat this cake once or twice a year is part of what makes it special. Whether you are photo hounds or not, I hope you had a wonderful Thanksgiving! Fab pics! Speaking of mocha cake, it's now time for those buche de noel yule log cakes. Yay! U are soooo funny!!! I laughed all the way down!! Wonderful photos and such a lovely family! An amazing feast with family~isn't that what it is all about? I love that our dad carves the bird in gloves (habit I guess as a doctor). Looks like you had a great time~and I knw you ate well; yum! we are also like that when families get together for a reunion..pictures are overflowing! Thanks for hosting sis. Your cauliflower was the bomb. Looks like you had a great Thanksgiving...Happy Holidays!